Once again, it's been a while, but I've put together one more release of RUNT. RUNT 5.0 is built from Slackware 11.0 and has updated versions of nearly every package. Of greatest significance is the much newer 2.4.33.3 kernel, which now supports most SATA controllers, as well as prism54 wireless devices. iproute2 and stunnel have been added for improved functionality. With all of these updates comes a substantial increase in size. I was unable to keep RUNT under 128 MB this time and maintain the level of usability in past releases. This version takes up about 200 MB when unpacked, so at least a 256 MB flash drive formatted with 4k clusters is required. There is a good chance this is the final release of RUNT because of a number of reasons. First off, as I mentioned in my last update, the usefulness and uniqueness of RUNT is declining. Live CD's are abundant, and USB flash drives are big enough now to just partition and install your favorite distro. However, I've always liked the convenience of RUNT, and the simplicity of installation. Because of the umsdos filesystem, RUNT usually doesn't require reformatting, and it only takes up as much space as it needs, unlike ramdisk and loopback based filesystems. Unfortunately, the umsdos filesystem has been ignored for years now, and has been dropped in the 2.6 kernel. RUNT in its current form depends on the 2.4 kernel, and this release contains a very mature version of that kernel. Perhaps it is the last one Slackware will include. There may be a few options for RUNT's future, but we'll just have to see. In any case, I think this release is an excellent, stable release, though still being based on the 2.4 kernel, it may not support as much hardware as most modern Linux distributions. I hope you enjoy it! NOTE:Due to excessive spam, and little to no actual content for some time, the forum and Bugzilla have been disabled. They took too much of my time to de-spam, and didn't seem to be helpful enough to users. If you feel otherwise, please email me. I might consider setting up a mailing list if that would be helpful, as that takes far less maintenance. As always, feel free to email me directly about issues or suggestions you have. Well folks, I've been offered a job by Google, so I'll by gone to California by the end of October. I'm not certain what this means for the future of RUNT. I'll do my best to get a software update release out before I leave, and I'll make every effort to keep the files available for download. However, since I'll no longer have access to NC State University I'll have to move the data elsewhere. I haven't decided yet where that will be. Once it moves there should be a notice up on this site of where the new site is. Once I'm working for Google, I'm not sure if I'll have time to continue developing RUNT. We'll see how it goes. Maybe Google will let me spend my 20% on it, but it remains to be seen if they see it as a viable project. I have to admit that there's less of a reason for RUNT to exist now. It began before Knoppix was popular, and before everyone had a pen drive. Most people didn't know what they were. At the time RUNT was the only pen drive distribution, but now several other distributions exist for installing on pen drives, and with the standard sizes approaching 1 GB, you can probably just install your favorite distro on a pen drive yourself. But, if I receive an overwhelming response to continue the project I may still work on RUNT on my own time. 11-11-04: RUNT Linux 4.0 released! Scripts to make USB booting easier then ever! The bootdisk can be created from the pen drive. You don't need to download the floppy image separately. I will be making a presentation at this month's TriLUG meeting. The meeting is at Dreyfus Auditorium in RTP, NC at 7:00 PM, Thursday 11/11/2004. Details and directions can be found on the Trilug website. Anyone in the Raleigh-Durham area should come out and hear more about RUNT. I know it's been a while, but RUNT 4.0 is almost ready. I hope to have it done later this week. To tide you over, here are a few useful tidbits. The RUNT 4.0 bootdisk is already available. You can download it here. It can be used with zipslack without any modifications. I've set up a forum for discussing RUNT. Please visit it and discuss anything RUNT related. That's all for now. Check back later for the new RUNT 4.0. RUNT 3.2 has been released. This release contains minor security fixes. The kernel has been upgraded to 2.4.24, lftp has been upgraded to 2.6.10, and rsync has been updated to 2.5.7. UPDATE: I ran out of space, so the original RUNT 3.2 was an incomplete file. I have fixed the problem, and the complete RUNT 3.2 is uploaded. To those of you who have sent me emails and I have not responded, please email me again. I have had e-mail issues recently and lost track of who I have and have not responded to. Thank you to all who have voted in the logo contest. The current status is roughly equivalent between two, three, and four. Due to several later submissions, I am extending the voting period until at least next release. If you have any more submissions, please send them to soon. Remember, what I'm looking for in a logo is something that will clearly indicate the purpose of RUNT. It should be clear that RUNT is a USB pen drive based linux. I've posted all the submissions I currently have, so please continue voting. If you like a new logo better than one you've already voted for, please indicate that in your email. RUNT 3.1 has been released. The kernel has been updated to 2.4.23. I received four logo submissions, and I've posted them all here Please go take a look and let me know which you like the best. 11-12-03: RUNT 3.0 has been released! RUNT 3.0 is based on Slackware 9.1 including kernel 2.4.22. New additions include iptraf for network monitoring, iptables, allowing RUNT to be used as a firewall, and cd/dvd writing tools. SCSI controllers are now supported through hotplug. To use cd burning tools with an ide drive, you must use ide-scsi by identifying your drive at the boot prompt. For example put 'usb hdc=ide-scsi' at the end of the boot prompt if your CD burner is your secondary master. I'm not certain the usefulness of cd burning abilities on a 128 MB drive, but I had the space, so I left it in. You can remove the package if you don't need it. Let me know what you think. Because of increased kernel size, memtest had to be removed from the bootdisk, but it can still be run if you are able to boot directly off of the USB drive. I have realized that RUNT needs a logo, if for no other reason, to identify it on distrowatch.com. I unfortunately have absolutely no graphical skills. (note the simplicity of this page, and that RUNT is a text only tool!) I envision something resembling a pen drive and perhaps tux (he goes on everything these days) but I'm open to suggestions. I definitely want something that will identify RUNT as a pen drive based tool, so that should be incorporated into the graphic. The image above came directly from linksys, so the RUNT logo probably shouldn't just be a modification of the linksys image. If you have some skills, put together an image and send it to me. If I get several submissions, I'll post them and have a vote. If I just get a few, I'll just pick one. The winner will receive an acknowledgment at the bottom of this page. Woohoo! 8-14-03: RUNT 2.0 is released! Just in time for it to be used by ResNet staff for Move-in here at NC State, RUNT 2.0 is available. RUNT 2.0 is much improved over 1.11 including such improvements as linux kernel 2.4.21, which has substantially improved hardware support, and hotplug, which is capable of autodetecting a much wider range of hardware than was previously possible. Also new is support for USB 2 improving speed on computers and drives that support it. Download it below, and let me know how you like it! RUNT is Slackware Linux designed originally to run off of a 128 MB or more USB pen drive. As of version 5.0, it now requires a 256 MB drive. It consists only of a zip file, and optionally a floppy image, similar to zipslack. It is intended to be a fairly complete Linux installation for use as a testing tool capable of booting on any x86 computer with a bootable USB port or any USB port and a bootable floppy drive. The kernel is slackware's bare.i kernel. RUNT also contains an initial ramdisk to load usb-storage related modules and pause for 5 seconds, allowing the USB drive to initialize. The zip file contains a UMSDOS filesystem designed to be extracted onto a 256 MB pen drive with an msdos filesystem using 4K clusters. (Larger cluster sizes are required for drives larger than 256 MB) The package set is based off of Slackware's zipslack, but contains other commonly used networking components not available in the zipslack distribution. RUNT was originally designed for use at North Carolina State University by the ResNet department. ResNet regularly provides support to students in University Housing using their personal computers on the NC State network. RUNT automatically probes for network cards on startup and configures them using DHCP. Although RUNT was was intended for use on the NC State network, there is nothing peculiar preventing RUNT from being a useful tool on any network. A USB 256 MB pen drive with an msdos filesystem using 4K clusters. Larger drives are also acceptable and will require a larger cluster size. Most any pen drive will work. Sandisk and Lexar make some of the most popular ones, and they are known to work well. RUNT can also work with any USB storage device such as flash card readers, cameras, watches, etc... Those are the weird ones people have sent in to me. Theoretically RUNT can run off of any FAT16 or FAT32 formatted drive accessible by the kernel. The bootdisk provided will work with fast USB drives or IDE drives. a USB zip drive takes longer to initialize, and the disk below doesn't provide adequate time. If you wish to boot RUNT off of SCSI or some other interface, another bootdisk will probably be required. Find or make a Slackware boot disk to meet your needs. If you can't boot off of USB, you'll need a blank floppy. To boot it you'll need any x86 based computer cable of USB booting or with a bootable floppy drive and a USB port. Download the zip file below. Unzip the zip file to the FAT partition off of which you intend to run linux. If extracting in linux, the drive should be mounted with -t msdos. This doesn't have to be the only thing on the drive, but make sure the extracted files are in two directory called linux and runtutil in the root of the drive. The process of writing to the USB drive takes a very long time in Windows. You may have better results extracting the file to a hard drive and then copying the linux directory to the USB drive. Also, enabling write-behind caching on the drive may speed it up slightly. This still took me almost an hour though. The fastest way is to just use Linux. It's done in a few minutes. In the runtutil directory, run the makeboot.bat(Windows) or makeboot.sh(Linux) script. This will make the pen drive bootable on computers that support it. If you require a boot floppy, run the mkfloppy.bat(Windows) or mkfloppy.sh(Linux) script. Restart the computer with the floppy in (if necessary) and USB drive connected. At the boot prompt just press enter, or provide your own parameters if necessary. If you use a USB floppy drive to boot, you may need to type usbfloppy on the boot prompt. If you are able to boot from USB, you can also type memtest to check the system's RAM for defects. If you need to select a different keyboard layout, type "usb keymap" at the prompt. NOTE: Windows NT/2000/XP/2003 is required to perform the operations in makeboot.bat and mkfloppy.sh. If you are using Windows 95/98/Me you should download the boot floppy below and create a floppy using RawWrite for windows. Alternatively you could perform the operation on another computer running Windows NT/2000/XP/2003 or Linux. Booting Knoppix or a similar live distribution will also make this possible. Use it like any linux system. Since I'm designing this to be used for network testing, there may be people less familiar with linux who might wish to use it. For those people, there are 2 pages of useful commands available by typing runthelp and diskhelp at the command prompt. 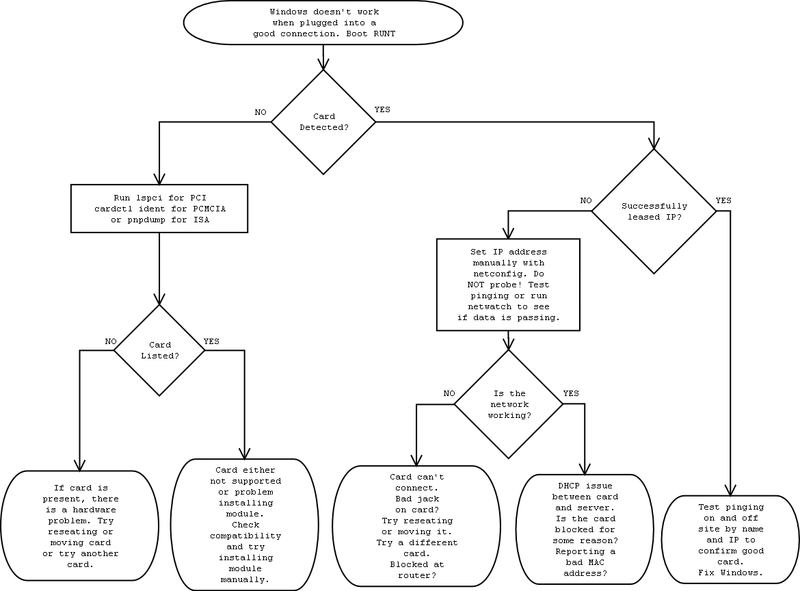 Here's a flowchart I put together with Dia that may be helpful in resolving network problems with RUNT. RUNT 4.0 - Old Version; required if you only have a 128 MB drive. I've moved this to a separate page. RUNT Linux is currently developed only by myself, Joel Ebel, using available GPLed projects. If you would like to contribute to the project, you can do so in one or more of the following three ways. You can contribute your ideas and suggestions to the project, you can contribute code to the project, or you can contribute financially. Suggestions should be sent to runt@mybox.org. Please remember that the current goal of the project is to be a lightweight linux distribution small enough to fit on a pen drive. Try to keep suggestions reasonable. If you have a package or a modification you would like to see included in RUNT, email me. I will remain in control of everything that gets included in the final releases, but I am open to many ideas and possibilities of what could be done with RUNT. If you have an idea, you should probably contact me prior to writing code for it to make sure no one else is currently writing it, and that I have interest in including it in the final releases. RUNT is not my job. It is a project I now maintain on a personal schedule. As a result, it takes up a great deal of unpaid time. If you would like to encourage future development of RUNT you may donate money to the project. It is, and always will be, of course, free. I make no recommended donation either. If you feel RUNT is worth something to you, please consider making a donation using the link below. If you have any suggestions, requests, comments, complaints, problems, etc. send them to me, Joel Ebel at runt@mybox.org. I'd be very interested in reports of hardware that doesn't work. Also, reports of USB drives that work or don't work would be great. Please tell me if you have any results regarding booting from USB. Additional packages that would be useful for network testing can be reported as well. Special thanks to Patrick Volkerding and Slackware Linux, who did most of the work for me already. Thanks to Chris Brady and Memtest86 for their great memory testing program I included in the zip file. Thanks to Erik Anderson for BusyBox and uClibc, which made the bootdisk possible. Thanks to H. Peter Anvin and Syslinux, which made booting possible at all.